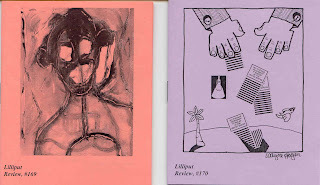 I'm currently working on, among other things, the new issues of Lilliput Review, #'s 169 and 170. Above is a sneak preview of the covers, by regulars Guy Beining, on the left, and Wayne Hogan, on the right. In a one person operation, the process can be quite drawn out. I hope to begin to get the contributor copies out first, in about two weeks or so, followed by the regular subscriber issues, coming out in waves beginning around the first of July. These days it takes me about 6 or so weeks to get the full run in the mail. Why, you may ask? I often ask myself the same question. The reason is I generally am replying to correspondence, poems and letters and all, and I always try to communicate in some normal, human way, as opposed to speaking editorese. I'm not always successful, in these as in many things in life, but I keep on trying. Simultaneously, I'm replying to the poetry batches I received, otherwise my 90 day turnaround would balloon to unconscionable lengths. And then there is that pesky full-time job. My proofer remarked how this time round there was lots that grabbed her attention, going beyond her normal dispassionate demeanor (and the usual by-the-way-there's-about-a-thousand-typos-this-time, bonehead ... I added the bonehead, she's too discrete for that, but it is how I feel). So, hopefully, there's lots of good stuff to look forward to. Ed Baker, always on the prowl for new, interesting items, passed along a link to new, free online poetry publications from ungovernable press: specifically, to Joanne Kyger's new poem, Permission by the Horns (this is a .pdf file). For those of you unfamiliar with Kyger, her work has been associated with the Beats and the general San Francisco poetry revival, strongly reflecting her Buddhist predelictions. 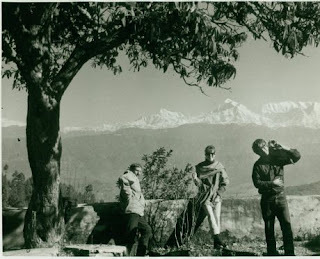 Here is a photo of Kyger with Gary Snyder and Peter Orlovsky from a pilgrimage to India in the early 60's (photograph by Allen Ginsberg). In addition to Permission by the Horns, which shows her unique balance, both literally and stylistically, of the personal, the political, and the natural, you may also read 10 (More) Lovely New Poems by Kyger at Michael Mcclure and Ray Manzarek's website (yes, that, Michael McClure and that Ray Manzarek). That cover on the left is particularly nice, I think.